LAST WEEKEND OF FESTIVAL FEVER – Don’t miss out! Our Autumn Festival & Butterfly Corner will soon be coming to an end but there is still time to make a visit! Our Dahlia Marquee has been refreshed and is looking stunning and, despite the weather, the Dahlia Field & Celebration Garden still have plenty of colour to offer! – Walk around our 2 acre Dahlia Field & Celebration Garden. – Treat yourself to something delicious in the Festival Tea Tent whilst enjoying a view over the gardens (the Festival Tea Tent will be serving Tea, Coffee, Cream Teas and Homemade Cakes 10am til 4pm this Saturday and Sunday). – Join one of our Nursery Tours – a chance to see behind the scenes guided by one of our production team. Tours start at 11.30am & 2.30pm, no booking necessary and free of charge. – Take a #aylettselfie at our Festival Selfie Station and share your visit with the world of social media. – Wish our Butterflies farewell as they get ready to move to their new home at Whipsnade Zoo. – Shop our extensive range of plants, garden sundries and seasonal products. – Enjoy lunch in our Dahlia Coffee House, serving a tasty selection of food and beverages. – Ask the Experts – visit our Plant Information Centre for free help and advice. 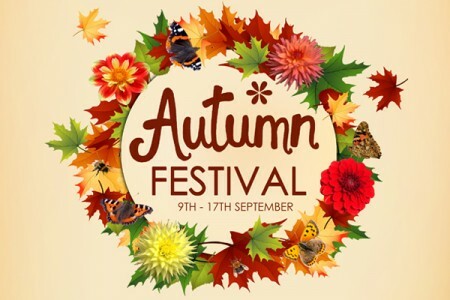 – Free, easy parking and no entry charge for any of the Autumn Festival events! We hope to see you at the Garden Centre this weekend! Next Post: GTN Gold Award Winners!